I would have NEVER known that you were wearing this the wrong way unless you said that. I just thought it was a ruffle decal thing, lol. But either way, it looks amazing and you rocked it! I am a sucker for red dresses.. the flutters on this one makes it look more feminine! I love this color on you! That's too funny about the sleves! I think it looks amazing the way you are wearing it!! Such a great color on you! you look beautiful! I have a dress like this and I have totally worn it both ways! I think this looks great as is and would never have known. Such a pretty dress, and red looks great on you! That's too funny about how you're wearing the dress, but it looks great that way, too! SUCH a gorgeous dress- you're a stunner, babe! I love that you wore this dress 'wrong' it looks so right, and works so well!! you can wear it different ways. How versatile and fun! I actually really like it without the sleeves as well! It makes the whole look more streamlined and classic! I don't normally get red items either, but for this dress I would make an exception! that red dress is amazing! you look so chic and gorgeous! That dress is fabulous! I love how much is pops! Ha, so before I had even read the post, I already pinned the first image! I wouldn't have been able to tell that it was meant to be worn a different way! 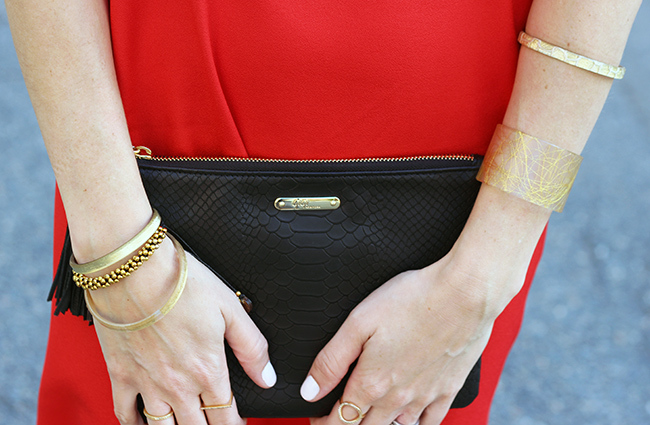 Love the accessories and shoes paired with this. 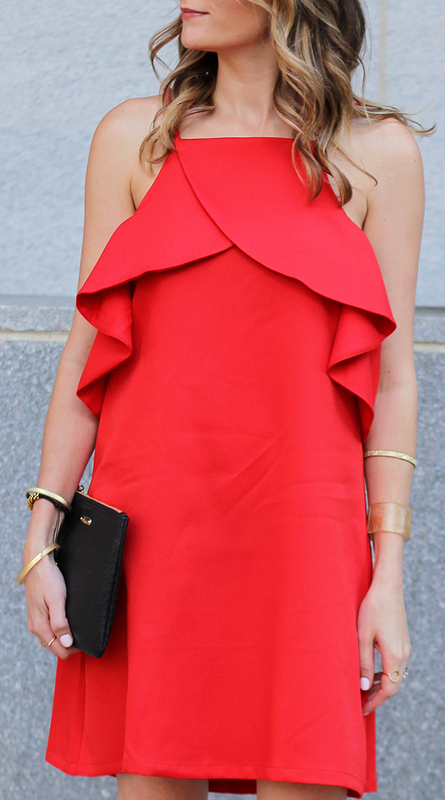 the red dress is show stopping and paired well with the shoes. such a good dress that i can imagine being paired dressed up or casual! Oh my gosh that's so funny! I really like it without the sleeves too, actually. I can't wait to see how you style it WITH the sleeves! I need a good red dress in my life. Wow! You are stunning in red lady! Love that dress! I actually purchased a similar red-ish coral dress this Summer I have yet to wear. You styled this to perfection and the photos and background are beautiful, Rachel. Red is your color, girl! This dress is beyond amazing on you!